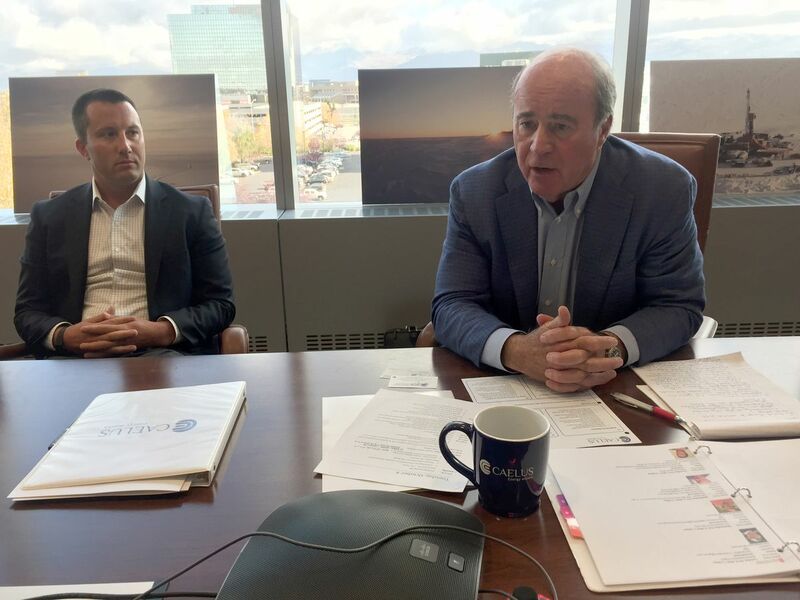 Caelus Energy's CEO said on Tuesday he is "terribly excited" about the company's oil discovery at Smith Bay and expects it to be larger than the multibillion-barrel find the company already is claiming. "Like all big fields, this one will probably grow" as more seismic data is gathered and more wells are drilled, he said. Jim Musselman and the Dallas-based firm has a reputation for important oil discoveries. Caelus said its internal estimates show the current Smith Bay lease-holdings contain 6 billion barrels, with about 30 percent to 40 percent of that recoverable. The company believes an additional 4 billion barrels may exist in adjoining acreage. Musselman said the company was limited this winter in the exploration work it could conduct on the frozen bay about 50 miles southeast of Barrow, drilling its two Caelus-Tulimaniq wells in locations that represented a compromise. After barging Doyon's Arctic Fox drilling rig to the remote location, Caelus chose to save time once winter arrived by drilling on ice nearshore in a few feet of water. That reduced the effort needed to build up rig-supporting ice pads farther offshore, in potentially better locations, using layers of water, said Musselman. "We didn't have time to sit there and pump water on the ice for days and weeks so we elected to go to more shallow water," he said. The two wells targeted what the company called a "large Brookian submarine fan complex spanning over 300 square miles." The company plans to drill a third well next winter — more than a year from now — an appraisal well located in a "primo" spot farther offshore, said Musselman. That well would create a sort-of triangular pattern to complement the two nearshore wells drilled about 5 miles apart, and give the company a chance to test well-flow rates, something it did not have time for this year. "We don't think we've drilled the best channels yet," Musselman said. Musselman said the "game-changer" for the field's potential is the light oil that flows easily, as well as modern technology involving fracking. In fracking, wells are injected with water, sand and chemicals to fracture the rock formation and enhance oil production. At its producing Oooguruk field on the North Slope, Caelus is already drilling horizontal wells and conducting what Musselman called the "biggest fracks" in the state, using close to 3 million pounds of "proppant," a term for sand used to fracture reservoir rocks. That's smaller than the 10 million pounds of proppant that might be used in shale-oil fields in the Lower 48, but it's big by Alaska standards, Caelus officials said in a sit-down with Alaska reporters. "We've become very good at fracking these wells," Musselman said. "We've improved every year and our production has improved every year. We've added new reserves at Oooguruk and our production is 20,000 barrels a day today." The company expects to conduct even bigger frack jobs than it has at Oooguruk to produce oil at Smith Bay, Musselman said. Caelus expects it will take five years to begin first oil production at Smith Bay. The cost to reach oil production is not yet known, said Musselman. Other Caelus officials attending the meeting noted it's still early in the process and concepts for development could change. The cost of full-field development is expected to range between $8 billion to $10 billion, with long-term plans that call for punching 250 producing wells into the bay, said Musselman. Expenses will include construction of an oil-processing facility to prepare oil for shipment and at least 125 miles of pipeline at a cost of $800 million. "Close your eyes and imagine all the stuff that's at Kuparuk," said Pat Foley, Caelus' senior vice president of Alaska operations, referring to the second largest oil field in Alaska, ConocoPhillips' Kuparuk River unit. For portions of the pipeline running off the coast in state waters, the company envisions a pipeline buried in a trench along the shore to prevent chunks of shore ice from crashing into the pipe. Such a system works well at the company's Oooguruk field, where oil moves in a buried pipeline from an artificial island to facilities on land, officials said. Caelus Energy is already looking ahead to next steps that include pursuing regulatory permits. The cost of exploration at Smith Bay has totaled about $130 million, with state credits expected to help pay for about $75 million of that, Musselman said. The company holds certificates from the state for that $75 million and another $25 million for other work, but has not been paid the roughly $100 million, officials said. The money was withheld as part of Gov. Bill Walker's decision in June to address the state's budget deficit by deferring payment to oil companies of $430 million in credits. Caelus has also done work at Oooguruk that should entitle it to another $100 million in tax credits, officials said. "We're owed about $200 million," said Musselman.